This book written by a travelling journalist sheds light on some of the highly profitable involvements of big business with disasters, wars and prisons. First the Australian author explains that Disaster Capitalism is a term coined by Canadian journalist Naomi Klein. He tells us that the wealthiest one percent of the world's population owns 46% of the world's assets. I've checked with Oxfam International and their report, Wealth: Having It All and Wanting More, clearly states that a tiny global elite is cornering the world's money and resources. Oxfam adds that by 2016 they expect the balance to be tipped in favour of the elite ownership by just 85 billionaires. We see in Afghanistan, on the author's visits, that massive private security firms provide escorts for visitors, hiring a mix of former soldiers and locals. Fine, except that clearly, continued turbulence is in their interests. Mineral rights are being bought up by outside countries for when the area is stable. Haiti suffered a devastating earthquake in 2010 - the author visited in 2012 and 2014 and says rubble, abandoned buildings, broken sewers and more are still visible. He claims that in keeping with a wry telegram from the US Ambassador released by Wikileaks, 'the gold rush is on', outside firms were swift to arrive and sell their services, soaking up almost all of the outside aid money. Cheap garment factories in an almost unoccupied industrial estate are, says Loewenstein, there to exploit cheap labour, not to make the island self-sufficient. We also see Greece, creaking under the strain of arriving migrants from Africa and Asia, while having been forced to sell off public assets to meet its debts. The endemic corruption which meant that some people made merry on EU funding for years had also meant that huge firms were not paying much tax. The author meets a paunchy, splendidly housed leader of a rising party with Fascist sympathies. He also meets householders unable to feed families and doctors with no medical supplies to dispense. The second part of the book deals mainly with the prison systems in Australia, the UK and the US. Some prisons are privatised and the companies can profit from the labour of the prisoners, sewing Kevlar jackets and so on. Loewenstein claims that it is not in the interests of the prisons to release offenders or to rehabilitate them and this has contributed in the US, to a racial tilt in favour of jailing minority offenders for life. In general, after two serious crimes and prison sentences there, a third crime of any sort means life in jail. He claims that people have thus been imprisoned for life for stealing a chocolate bar. Still, if people have not learned their lesson after two jail terms society feels safer by locking them away from ordinary people. I like that we also get an interview with a resident of a town next to a large prison, who did not find that prospects were good for employment. I've heard that elsewhere it has been hard to get businesses to invest in a town with a big prison, and it's not a touristic option. While the economic situations regarding bank collapses and disasters are well presented, as always the ordinary reader learns a lot from personal interviews such as those Loewenstein salts through the book. This is largely good journalism, maybe a little biased towards one view, but showing a wide picture. Other journalists are cited, such as Matt Taibbi of Rolling Stone and John Pilger. I was critical of the way the 'gold rush' cable above was portrayed - as though the ambassador was seen capering and rubbing his hands. We have no knowledge of this and the diplomat may have been using a wry phrase in a weary, ironic tone. 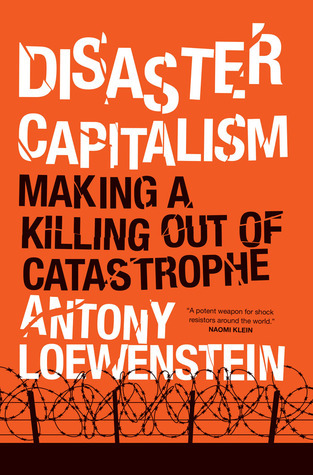 In general I would recommend DISASTER CAPITALISM to help understand our globalised world. At the end we are reminded that people power, through votes, candidates, purchases and social media, may bring about positive change. Let's do it. I was excited to receive this book as an advance copy from NetGalley. After a long career in law enforcement and corrections, I have my own opinions about the recent move to "for-profit" correctional agencies. The preview of the book indicated that the author would address this phenomenon. I was sadly disappointed. Instead of addressing the issue in a fair, balanced manner, the author instead decided to do a hack job, filled with biased personal opinions. He laid bare his disapproval of capitalism. In the chapter regarding the state of corrections in the United States, he chose to call names and disparage people. For example, his observations of correctional professionals as "many of the participants were overweight", and "filled with mostly white men with substantial bellies". I wonder how it would come across if he had instead stated, "many of the women were ugly", or "filled with mostly scary black men"? I thought calling people names based on physical characteristics was frowned upon? Also his observations that the "state deliberately placed these facilities in remote areas where poor health and conditions were inevitable", as well as "competent legal representation was rare, and many immigrants appeared before the court without any knowledge of their legal rights". And his statement that President Obama was giving business to "corporations that ignored federal laws and abused human rights". Finally, his assertion that the ACA (American Correctional Association) was a bogus organization that really served only itself. Anyone who has been through an ACA audit (and I have been through more than a dozen of them) can only come away with a sense of awe at how thorough and professional they are conducted. I found the rest of the book to be filled with more of the same wild speculations and opinions.No, Mr. Loewenstein cannot claim that his book builds on the best-selling 2007 book "The Shock Doctrine" by Naomi Klein. Far from it. I would not be surprised if Ms. Klein is trying to distance herself from this pile of garbage. Would not recommend to anyone! Disaster Capitalism is frankly a brilliant piece of investigative journalism. There can be no doubt that the book is partisan. Insofar as the author deigns to make an argument. One that, as the name might suggest, is critical of the current capitalist status quo, and dissenting of the continued march of neoliberal politics across the globe. Perhaps the best parts of this book are the many interviews that Loewenstein undertakes and documents. And the most memorable of the quotes for me is that spoken by mercenary, Jack. The USA is no longer capable of running empires. Indeed, no western state is. Instead, using Thatcherite and Reaganite neoliberal market ideology, these states can send their private multinationals in to devastated parts of the globe and exploit. It is neocolonialism writ large. Loewenstein explores the rise of the private security firm in exported wars fought by western nations as wars of "liberation", from which the winners are always private companies. Private companies with staff who will come in, fleece their slice of the pie and run. Leaving a trail of destruction, destabilisation, division and resentment in its wake. From here the analysis looks at the refugee crises, and how immigration detention centres (a euphemism for jails for those with temerity to flee war zones and climate change). Again, secretive multinationals collude with government. As a Brit, I know that journalists cannot access Yarls WoodImmigration detention centre. Why? Simple, it's easy to brutalise quietly and never be held accountable. Finally, Loewenstein looks at natural disasters. Another industry in which greedy NGOs affiliated with states and multinationals enter. Haitian earthquake relief frequently bypassed Haitians on the ground. Paradoxically increasing food prices for the poorest, whilst also depriving them of labour. This is a must read for anyone who honestly believes that unaccountable multinationals with offshore bank accounts, the ears of power and an ability to lower their own costs whilst also avoiding taxation burdens in local places can in any way benefit those that need public services and assistance most. An interesting and thorough follow up to Naomi Klein's Shock Doctrine. Some overlap, but all in all an excellent and well-researched book that furthers Klein's tracking of disaster capitalists. This book was a chore to read. The journalistic style employed by the writer as the endless parade of names, numbers and places became mind numbing and lost all impact. Although this book is not a polemic it certainly has an agenda and that leaves a narrow point of view. There is no real counter point to any of the points being made. This is not the writers entirely the writers fault as most businesses are not prone to talk openly about their practices but it left me wanting more. Also the title was misleading. I expected a book about the capitalist exploiting disasters for profit and that is not the crux of this book. It deals more with globalization and the collusion between governments and businesses in that area. The trouble is that it does not do it very well. There are too many personal horror stories to have any true impact and the lack of graphs or illustrations meant I never really got the bigger picture. I would have liked more about the companies involved and the corruption that keeps them afloat to add another dimension. This book was more reporting than writing. That works well in magazine articles but becomes redundant when printed in the larger book format. Reading this was a marathon – and not only for the subject matter, but also for the prose style, which was exhausting. What works as journalism sometimes proves hyper-energetic and then overwhelming as a book. Best in short doses. A book both damaging to the capitalist system and to our conscience which largely ignores its disastrous effects. This book offers solid examples of how the people who are worst off around the world are being exploited and how the institutions are making so much money off of them.